What’s Your Wind Zone Need? Here at Texas Repos we serve many Texas Mobile Home buyers and with such a great State that is such a great size, there are many different mobile home needs for our multitude of customers. One of these variations in your mobile home purchase is what WIND ZONE will you need? 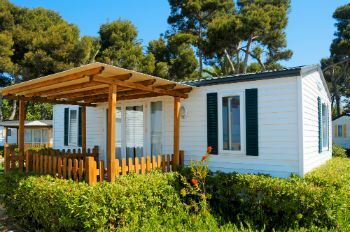 Every manufactured home must be designed according to the Federal Manufactured Home Construction and Safety Standards commonly called the HUD Code. This code stipulates that the home shall be designed and constructed to conform to one of three wind load zones. The appropriate wind zone used in design is dependent on where the home will be initially installed. Homes designed and constructed to a higher Wind Zone can be installed in a lower Wind Zone (a Wind Zone III home can be installed in a Wind Zone I or II location). However, a Wind Zone I home cannot be installed in either a Wind Zone II or III area. So now you’re wondering why this stipulation? The simple answer is YOUR safety. If you are in an area vulnerable to hurricanes or tornadoes, tying down your mobile home is more than essential. Proper tie-downs can increase the wind resistance of the structure enough to allow it to survive wind gusts higher than 70 miles per hour. Wind loads must be resisted by the home. The home must be manufactured in such a manner as to resist force winds and stabilize itself when faced heavy wind loads. The manufactured home producer designs the home to resist the wind load, which is measured in pounds per square foot. Wind Zone I equates to a 70-mph fastest-mile wind speed. Wind Zone II equates to a 100-mph fastest-mile wind speed. Wind Zone III equates to a 110-mph fastest-mile wind speed. Proper wind zone requirements for your area means the home is adaquatly transmitting wind loads to stabilizing devices without exceeding the allowable stresses or deflections. Roof framing is securely fastened to wall framing, walls to floor structure, and floor structure to chassis to secure and maintain continuity between the floor and chassis, so as to resist wind overturning, uplift, and sliding as imposed by design loads in this part. Wind Zone concerns relate to WHERE your home will be located and setup. The further inland you go the less wind zone you need. Here at Texas Repos we sell all three wind zone homes. When you call us to purchase a home, let us know where you are having the home set up to ensure the mobile home is exactly what you need for where you need it.